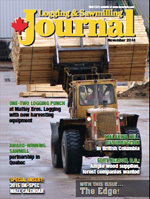 Sawmills in the Canadian forest industry continued to be active places this fall, thanks to healthy U.S. housing starts—which were recently over the one million mark for the third time this year—and continuing demand for lumber from China, as well as steady demand from other markets. Add to this a lower loonie, and the outlook for the industry looks reasonably bright going into 2015. If you’re looking to set up a sawmill operation, B.C.’s Northern Rockies Regional Municipality and the town of Fort Nelson want to talk to you—and they have a basket of sustainable green timber in their back pocket. B.C.’s Mattey Bros. Logging has a relatively new one-two punch on the harvesting end these days, in the form of a John Deere 959K tracked feller buncher and an 870C Tigercat tracked buncher, and both machines are delivering the goods. A logging and farming combination approach to business is working well for brothers Marcel and Alain Chalifour of logging contactor Almar Limbing in Saskatchewan, with the brothers sometimes dividing their time between harvesting trees, and crops. A sawmill in the small B.C. Interior town of Malakwa has been resurrected with some capital—and plenty of hard work—and is now producing green hemlock lumber for the Chinese market. B.C. Interior logging contractor John Himech Logging Ltd has to be ready for whatever Mother Nature sends their way—including wildfires that can throw harvesting schedules out of whack. The award-winning Opitciwan sawmill partnership between Resolute Forest Products and the Atkamekw Council of Obedjiwan Quebec First Nations stands out as a model for other First Nations/forest industry partnerships across Canada. Jim Stirling talks about how B.C.’s Forest Practices Board keeps an eye on the forests. As more First Nations groups recognize the economic benefits of taking advantage of the often large forest resources in their midst, a longstanding partnership between a Quebec First Nations group and major forest company Resolute Forest Products in the Opitciwan sawmill stands as a model for other potential partnerships across Canada. Joseph Fortin, director of woodland and sawmill operations for the Opitciwan operation, says the company’s relationship with the Atkamekw Council of Obedjiwan Quebec First Nations has been in place for 14 years and is a true partnership with shared responsibilities. Resolute provides its sawmilling, forest management, and sales experience, while the First Nation provides its local knowledge regarding traditional land use, sawmill employees, as well as woodlands employees for both logging and transportation. This successful partnership between the First Nation and Resolute was recently recognized by the Forest Products Association of Canada (FPAC) and the Canadian Council for Aboriginal Business (CCAB) with their Aboriginal Forest Products Business Leadership Award. 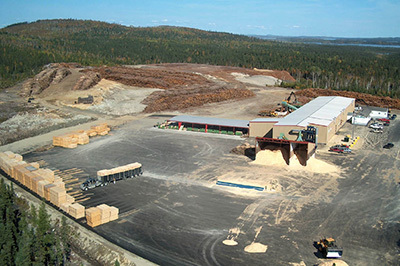 The sawmill—located about three hours west of Lac St-Jean, Quebec and established in 1999—is a random length mill operation producing about 45 million board feet of lumber annually from about 230,000 cubic metres of black spruce, jack pine and balsam fir. The wood averages about 20 centimetres in diameter and is delivered cut-to-length to the sawmill in 16’ logs. Their highest volume item is 2 X 4’s in lengths up to 16’. The First Nation has a controlling interest in the partnership at 55 per cent, while Resolute has a 45 percent stake. Representatives from the Opitciwan sawmill, the Forest Products Association of Canada, and the Canadian Council for Aboriginal Business recently gathered (right) to recognize the granting of an Aboriginal Forest Products Business Leadership Award to the sawmill. The sawmill is 55 per cent aboriginal-owned in partnership with Resolute Forest Products and provides the communities around the sawmill with 125 jobs. The sawmill produces rough lumber, which is transported to planer mills owned by Resolute in both La Doré and Normandin, Quebec for drying and finishing prior to shipment, primarily to supply the housing market in the U.S. Resolute Forest Products operates five other sawmills in the Lac St.-Jean area in addition to its partnership at Opitciwan. About 125 people from the Obedjiwan community are employed by the sawmill or in forestry operations, making it by far the biggest local employer. About 95 per cent of sawmill employees are local aboriginal residents while about 20 per cent of the workforce in logging and the log haul are aboriginal. Fortin says the partners worked very hard to keep the sawmill operating—even during the lean times of the recent housing crisis in the U.S.—because of how important these jobs are to the community. Four of the seven members of the Board of Directors come from the community and they also hold a number of supervisory positions in both the sawmill and logging operations. The sawmill operates on two, 10 hour shifts, four days per week. “We believe that it’s certainly a good model for other communities, considering the positive impacts it has created in the community of Obedjiwan over the years,” says Fortin. He adds that it is quite clear that an industry like a sawmill is a good asset for a community, and something that other communities in the area would welcome. The Opitciwan sawmill has an annual economic impact of $20 million. 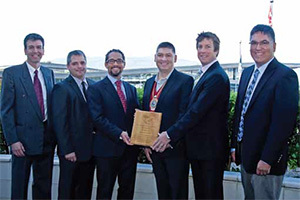 The FPAC/CCAB Aboriginal Forest Products Business Leadership Award that Opitciwan won celebrates aboriginal entrepreneurs for their success in a forest products business that exemplifies business leadership, exceptional environmental and safety performance and the delivery of high-quality products and services. The award recipient must also demonstrate a strong long-term commitment to the aboriginal community, especially aboriginal employment. As part of FPAC’s Vision2020 initiative, the forest products industry is committed to attracting more aboriginal workers and the dynamic Opitciwan joint venture highlights how it can be done, said David Lindsay, President and CEO of FPAC. There are now about 1,400 aboriginal-owned forest products businesses in Canada, and about 17,000 aboriginal people working in the sector, making the forest products industry in Canada the largest employer of aboriginal workers. This is the fourth time that FPAC and CCAB have presented the leadership award. In addition to operating a successful sawmill, the Opitciwan sawmill partnership was also the first aboriginal company in eastern Canada to receive Forest Stewardship Council (FSC) certification for its forest management practices and engagement with the local aboriginal community. For example, the sawmill will shut down production to accommodate local cultural and traditional activities, such as both a spring and a fall goose hunt, and for two weeks of blueberry picking in summer. The income gained from the partnership has provided financial support for radio and Internet service to the community. FSC is an internationally recognized, third party certification program. The Opitciwan sawmill operates one production line. In terms of production equipment, logs enter one of two Nicholson 17” debarkers at the infeed, leading to three sorting bins. The logs are processed through a Sawquip International canter twin, curved sawing and bull edger breakdown line. After the edger, material is either manually directed back to the bull edger or to the trimmer. The goal is to achieve as much optimization from each log as possible. The sawmill was built between 1998 and 2000, with regular upgrades since then, giving it fairly advanced technology at the front end. For example, the new canter twin breakdown unit was installed last winter at a cost of about $750,000. The curved sawing technology and bull edger were installed four years ago. “By making these investments, the goal was to increase the fibre use ratio by 10 to 15 per cent, resulting in less fibre loss and greater efficiency,” says Fortin. By upgrading from a twin saw breakdown system to a twin saw canter, they produce fewer chips. The overall goal at the sawmill from a community relations standpoint is to combine both advanced technology at the front of the mill with maintaining some manual labor elements further downstream to provide jobs to local residents. Once the sawn material exits the edger and trimmer, there is a considerable amount of manual sorting and piling that takes place. “It was planned like that right from the beginning to make sure that we created a certain number of jobs as well,” says Fortin. After the trimmer, there are eight workers who manually pile the rough lumber depending on their dimensions, those being either 2 X 3, 2 X 4 or 2 X 6 and in lengths from 8’ to 16’. Bundles of 2 X 4 are transported to La Doré, and other dimensions are sent to Normandin. Resolute Forest Products provides its sawmilling, forest management, and sales experience, while the First Nation provides its local knowledge regarding traditional land use, sawmill employees, as well as woodlands employees for both logging and transportation.